The GRAIL (Gravity Recovery and Interior Laboratory) mission is a part of NASA's Discovery Program. It will cost $375 million and is scheduled to launch in 2011. GRAIL will fly twin spacecraft in tandem orbits around the moon for several months to measure its gravity field in unprecedented detail. The mission also will answer longstanding questions about Earth's moon and provide scientists a better understanding of how Earth and other rocky planets in the solar system formed. Scientists will use the gravity field information from the two satellites to investigate the interior of the moon from crust to core to reveal the moon's subsurface structures and, indirectly, its thermal history. The study technique GRAIL will use was pioneered by the joint U.S.-German Earth observing GRACE (Gravity Recovery and Climate Experiment) mission launched in 2002. The GRACE satellites measure gravity changes related to the movement of mass within the Earth, such as the melting of ice at the poles and changes in ocean circulation. As with GRACE, both GRAIL spacecraft were launched on a single launch vehicle. 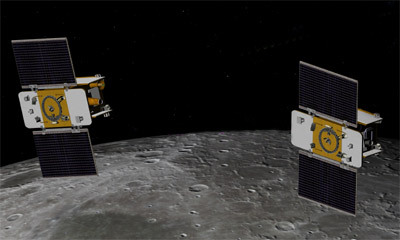 The lunar mission will use two identical spacecraft orbiting the moon in a low, polar orbit. The spacecraft are based on the flight-proven XSS-11 technology demonstration satellite developed for the Air Force Research Laboratory. They will use Ka-band ranging instruments to send signals between one another, and then relay the data back to Earth to be analyzed. Scientists will examine the minute differences in distance the signals traveled between spacecraft. This will give unprecedented insight into the gravitational changes over the entire moon. GRAIL's principal investigator is Maria Zuber of the Massachusetts Institute of Technology. Zuber's team of expert scientists and engineers includes former NASA astronaut Sally Ride, who will lead the mission's public outreach efforts. A camera aboard each spacecraft will allow students and the public to interact with observations from the satellites. Each GRAIL spacecraft will carry the cameras to documents their views from lunar orbits. The GRAIL spacecraft were launched side-by-side on a single Delta II vehicle during a 26-day launch period that opens on 8 September 2011. The mission was designed to avoid the December 10th, 2011 and June 4th 2012 lunar eclipses which interfere with the mission. The Goldstone complex will implement initial acquisition including solar array deployment. The trans-lunar cruise phase consists of a 3.5-month low-energy transfer via the Sun-Earth Lagrange point 1 (EL1). Compared to a direct trajectory, this low-energy transfer was chosen to reduce the spacecraft fuel requirements (by ~130 m/s), to allow more time for spacecraft check-out and out-gassing, and to increase the number of days available in the launch period each month. Both spacecraft approach the Moon under the South Pole where they execute a 60-minute Lunar Orbit Insertion (LOI) maneuver to put them in an elliptical orbit with a period of just over 8 hours. The LOI for each of the spacecraft are separated by one day. Each LOI is simultaneously visible from the Goldstone and Canberra DSN complexes. A series of four maneuvers are then performed to reduce the orbits to near circular with a mean 50-km altitude and 113-minute period. Further maneuvers position the spacecraft to the desired initial separation distance, which then drifts between 175 km to 225 km. The 90-day Science Phase is divided into three 27.3-day nadir-pointed mapping cycles. Two daily 8-hour DSN tracking passes acquire the science and "E/PO MoonKam" data. The two GRAIL spacecraft in a 25 × 86 km lunar orbit, completed their primary mission on May 29 and their science instruments were turned off until Aug 30, when they will begin a several-month extended mission in a 23 km altitude orbit. Following the Science Phase (or extended mission phase), a 5-day decommissioning period is planned, after which the spacecraft will impact the lunar surface in ~40 days. On 17. January 2012, NASA announced the names Ebb and Flow for the probes.